Theoretically speaking, if tyrannosaurs were still present these days, or in some way or another brought back, would they be kosher? Let's assume that they are properly slaughtered and prepared. Fish: Scales could not be removed without ripping skin. Reptile, insect, animal (Behema/Chaya): Neither a grasshopper, nor split hooves. See picture below. Extant crop: Subject to observation of specimen. Peelable inner lining of gizzard: Subject to observation of specimen. Extra claw. Depends on rabbinic opinion. See picture below. Not a bird of prey. Well, yes. Very much so. So if not for anything else, it is certainly a bird of prey (doreis), which is only kosher with a tradition (mesora), which tyrannosauridae of course do not have. I would think not, because they probably wouldn't be kosher animals. And every animal that has a split hoof and has a hoof cloven into two hoof sections, [and] chews the cud among the animals that you may eat. 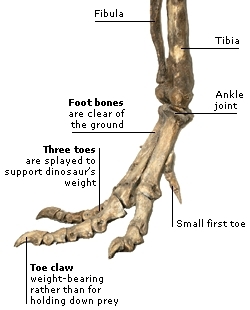 I don't think that tyrannosaurs had split hooves; I'm pretty sure that they didn't chew their cud, either. If you'd rather consider them birds, they would be forbidden anyway. The signs by which the clean animals, domestic and wild, may be distinguished [from the unclean and prohibited ones] are mentioned in the Holy Law, but not those of fowl. The sages have, however, established, "That every [predaceous] bird, which strikes its talons into its prey, is of the unclean: every bird which has an additional claw, a crop, and of which the internal coat of the stomach may be readily peeled off, is of the clean species." R. Eleazar ben Zadok saith, "Every bird which [when placed on a perch] divides its toes equally, is an unclean one." Also, if it would be classified as a bird, it would be missing the critical aspect of "מסורה," a "tradition" that was passed down that this "bird" is kosher. Kosher birds are eaten by "tradition," which means that it's known by the people of that place that this is a kosher bird. Some say that you cannot rely even on this (to check the size and shape of the beak), and one cannot eat any bird unless there is an accepted "tradition" that this is a kosher bird. This is how we've decided to act, and one cannot change from this. Let's see. What exactly are dinosaurs? For a long time, they have been considered lizards. Lizards are not kosher, due to lack of kosher signs. What if they're birds? The Torah (Devarim 14:11-20) gives a list of non-kosher birds, so it seems that everything else is kosher. Now, it might just be me, but דינוזרים (dinosaurs) aren't on that list. But wait! Maybe they are - the word "dinosaur" is relatively modern. The truth is that we've lost the mesorah for what most of them are, so we only allow birds known to be kosher. One thing all of the no-noes have in common is that they are birds of prey, or at the very least, scavengers. T. Rex was either a hunter or a scavenger. A more interesting question would be about herbivorous dinosaurs - could those possibly be kosher?? Not the answer you're looking for? Browse other questions tagged halacha kashrut-kosher animals . What defines a “בהמה” (also “חיה”) for the application of kosher-animal indicators? Is there a concern regarding the kashrut of microorganisms? Why is meat only kosher if a Jew slaughters the animal?